Do you have the crushed tissue box in the car problem? Here is an inventive, yet cheap and easy solution! 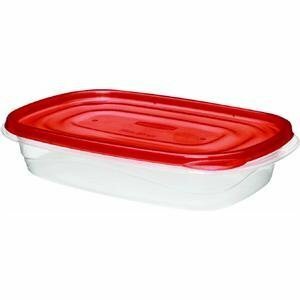 Get a Gladware, Rubbermaid or Ziplock large size rectangle container, and a low profile Kleenex box. Cut a slot in the bottom of the plastic container. 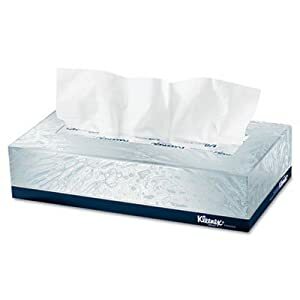 Place your tissue box upside down, inside the plastic container. Close with lid. Turn over, pull tissue thru the slot you cut - and Voila! 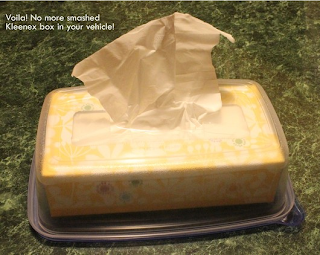 No more crushed tissue box in your car! Alex Summersell posted: Mine usually would get smushed and have a drink spilled on it. This works for both.